Kirsten Hall is a former preschool and elementary school teacher who has authored more than a hundred learn-to-read stories for emergent readers. Today, she is the founder and owner of a boutique children’s book illustration and literary agency, Catbird Productions. Hall is the author of the picture books The Gold Leaf and The Jacket, which was a New York Times Notable Book of 2014. Isabelle Arsenault is an internationally renowned children’s book illustrator whose work has won many awards and much praise from critics. Her books include Virginia Wolf by Kyo Maclear, Cloth Lullaby by Amy Novesky, and Jane, the Fox, and Me by Fanny Britt, which was named a New York Times Best Illustrated Children’s Book. The poetry expressed through Isabelle Arsenault’s graphic universe, the gentleness of her lines and the overall charm of her books have made her one of Quebec’s best-known and most esteemed illustrators. Visit Isabelle online at IsabelleArsenault.com. 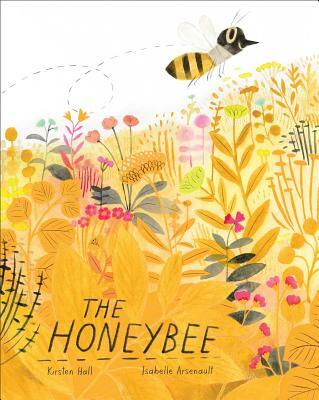 "Kirsten Hall (“The Jacket”) teams up with the gently magnificent illustrator Isabelle Arsenault (“Cloth Lullaby,” “Colette’s Lost Pet”) to bring readers the story of one year, from spring to spring, with the honeybees of a single hive. Hall’s charming text proceeds in lightly cadenced lines.... Arsenault’s illustrations capture something of the alien vision of bees — bees see a “bee purple” in flowers that is invisible to us — through a neon orange that she uses sparingly amid paler gouache, pencil and ink landscapes. Her flowers and grasses are drawn impressionistically, while the bees themselves are made more emotionally legible with cartoonish eyes and even smiles. Children will love tracing the erratic paths of the honeybees, and come away with a not too distorted sense of the little honey factory inside the unprepossessing, and previously terrifying, hive. The hexagons of honeycomb, as drawn by Arsenault, seem so perfect as to be fanciful precisely when they are fact." * "In bouncy, lilting verse and vibrant, inviting artwork, this ode to the humble honeybee is dripping with charm.... Hall's lively lines skitter around Arsenault's warm, honey-colored illustrations.... With occasional speech balloons and delightfully expressive gestures, the bees mirror the gleeful tone of the poem.... Arsenault's scenes are a captivating mixture of smudgy charcoals, soft yellows, and fluoresecent oranges, combining crisp shapes with more abstract figures. The entertaining tone and freewheeling art are a pure joy, but there's plenty of science here, too, and a closing note about the importance of bees to our ecosystem brings the point home. Boisterously written, gorgeously illustrated, and sneakily educational." * "The Honeybee is a delightful introduction to the crucial role of nature's hardest workers... Hall's language is rich and lively. Her cadence buzzes with all the energy of a hive. The Honeybee is a joyful read-aloud - the rhymes and repetition are as much fun to speak as they are to hear. Quebec illustrator Isabelle Arsenault...brings the text to life with her signature mixed-media style... Hall and Arsenault are a perfect match. Each of their work acts to strengthen the other's; neither the words nor the pictures are overshadowed. The Honeybee also strikes an ideal balance between fact and fiction, proving that accuracy and playfulness are not mutually exclusive." "Hall’s nimble rhyming verse and Arsenault’s warm illustrations provide an upclose visit with a friendly colony of anthropomorphized honeybees.... The text’s varied rhythms mimic a bee’s movements in a summery world; that atmosphere is captured in the mixed-media illustrations’ muted palette.... Bright pops of yellow-gold are used sparingly for pollen, honey, and a few flowers.... Hall’s appended page-long letter to readers (packed with bee wordplay) provides more information about pollination and emphasizes what readers can do to help protect honeybees." "Children will be buzzing to learn more about honeybees after reading this story. Hall takes her readers on a sunny romp through a springtime pasture abuzz with friendly honeybees in this bright and cheerful picture book. Hall's rhyme scheme is inviting and mirrors the staccato sounds of a bee buzzing... the vocabulary is on-point as the bees demonstrate the various stages of nectar collection and honey creation. Arsenault's illustrations, a combination of ink, gouache, graphite, and colored pencil, are energetic and cheerful.... A sensible choice for read-alouds and STEAM programs. Readers (and listeners) will think that this book is the bee's knees." "Hall celebrates honeybees with a lyrical poem... well-crafted rhyming couplets beg to be read aloud. Set on gloriously illustrated pages and nicely paced, the text appears to be hand printed in varying fonts, becoming part of Arsenault’s light and lively illustrations.... While the narrative and illustrations will appeal to very young listeners, the back matter, which touches on current threats, seems addressed to older children, suggesting ways in which they can help honeybees survive. VERDICT: A sweet success." "Embraces the pleasures of listening as well as learning as it follows the denizens of a particular hive over the course of a year. . . . Hall’s poetic text lets internal and ending rhymes, imagery, dialogue, and onomatopoeias flit, zoom, and hover in consonance with the apian protagonist. Arsenault’s pencil, paint, and ink pictures are gloriously vibrant, judiciously balancing black, grays, and golds, and directing and refreshing young viewers’ attention with touches of her blazing yellow-gold. In an appended letter to readers, Hall notes the importance of honeybees and suggests ways children can help support these crucial creatures." "The plight of the endangered honeybee is the raison d’être of this story.... Dominated by golden hues punctuated with splashes of neon yellow, the airy mixed-media art by Arsenault (Cloth Lullaby) helps kids decipher the goings-on, in and out of the hive. Tips on how to help preserve the bee population follow the story."